Mourners Recall Kennedy's Generosity, Persistence Niece Caroline Kennedy and nephew Joseph P. Kennedy told mourners at the memorial service for their uncle Edward that "Teddy was always there." "He taught me to be a better senator," said GOP Sen. John McCain, one of several Senate colleagues to pay tribute to Kennedy. Surrounded by a broad cross-section of the nation's political elite, the extended Kennedy clan gathered in Boston Friday night to remember one of the most influential senators in U.S. history. Democrats and Republicans alike paid tribute to Sen. Edward Kennedy as a life-long champion of the less fortunate, while his family also remembered him as a father, uncle and patriarch who helped guide them through tragedy after tragedy. "Every single one of my brothers and sisters needed a father, and we gained one through Teddy," said Joseph P. Kennedy, Ted's nephew and the son of the slain Robert F. Kennedy. "For so many of us, we just needed someone to hang onto, and Teddy was always there." Hear full audio of Friday's service at the JFK library in Boston. 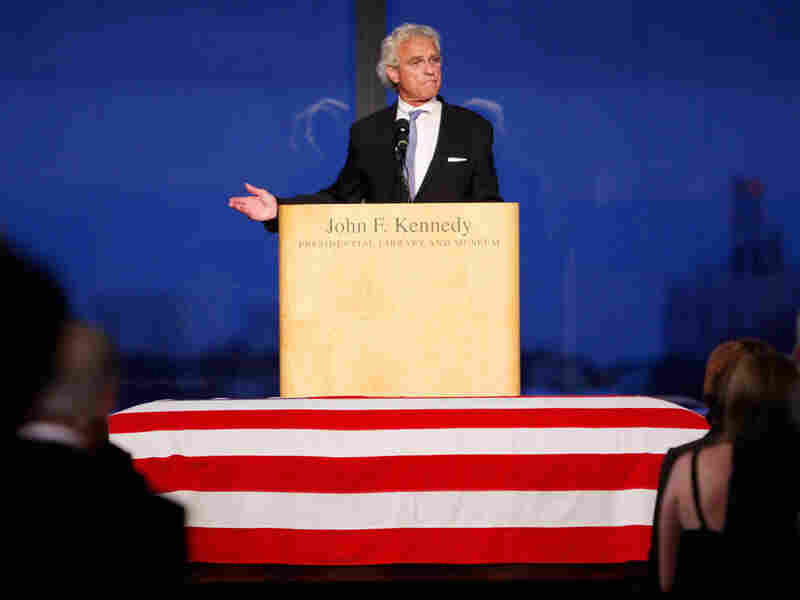 The evening was billed as "A Celebration of Life," and speakers shared their favorite Ted Kennedy anecdotes, even as they said goodbye. There were stories about the time Kennedy dressed as Elvis Presley, complete with tight jumpsuit, for his annual staff Christmas party. Others recalled his daring, perhaps foolish, sailing endeavors. Utah Republican Sen. Orrin Hatch wiped away tears as he fondly recalled Kennedy as one of his closest friends, who used to blow cigar smoke in his direction during contentious debates. Despite being on opposite sides of most issues, Hatch recalled the numerous times they had worked together to pass legislation, including bills on children's health insurance and national service. "I miss fighting in public and joking with him in the background," Hatch said. "I miss all the things I knew we could do together." Vice President Joe Biden, who served in the Senate with Kennedy for 36 years, said the lawmaker took on the role of being his "older brother." In 1972, when the two barely knew each other, Kennedy called Biden in the hospital almost every day after the tragic car accident that killed his wife and infant daughter and left his two young sons badly injured. From then on, Biden said, "It seemed like everything I did, he was there." Biden said it was Kennedy's deep generosity and selflessness that made him such a uniquely effective politician. "His dignity, his lack of vitriol, his lack of pettiness forced some of the less generous members of our community to act bigger than they were," Biden recalled. "People didn't want to look small in front of him, even the people who were small." "With Teddy," he added, "it was never, ever about him." Speakers strove to capture the sweeping legacy of a man who spent 47 years in the Senate. 8 a.m.-3 p.m. Additional hours for public visitation at the JFK Library and Museum in Boston. 7-9 p.m. Private memorial service at the JFK Library. Speakers to include Joseph Kennedy II and Sens. Christopher Dodd, John McCain, John Kerry and Orrin Hatch. "This was a man who cared so deeply about those on the outside of political and economic power people who struggled, struggled each and every day just to get by," Joseph Kennedy said. "He lived his whole life fighting for those people." Kennedy's niece, Caroline Kennedy, said his death places new responsibilities on those he left behind. "Now Teddy has become a part of history, and we are the ones who will have to do all the things he would have done — for us, for each other and for our country," she said. It was also a moment to situate Ted Kennedy's place in history alongside his legendary brothers, John and Robert. "John Fitzgerald Kennedy inspired our America, Robert Kennedy challenged our America, and our Teddy changed America," said Democratic Sen. Chris Dodd, who served with Kennedy in the Senate for nearly three decades. "Nearly every important law passed in the last half-century bears his mark, and a great many of them, of course, bear his name." Billed as "A Celebration of Life," the service featured a parade of political figures, many of them Kennedy's long-time Senate colleagues from both sides of the aisle. "He took the long view. He never gave up," Republican Sen. John McCain told the crowd. "And although on most issues I wished he would give up, he taught me to be a better senator." Some conservatives had warned against using the memorial as an occasion to push Democratic plans for health care reform, and there were only a few mentions of the current bitter battle. Fellow Massachusetts Democrat Sen. John Kerry spoke about Kennedy's dedication to universal health care. "In his final days, he labored with all of his might to make health care a right for all Americans, and we will do that in his honor," Kerry said. The ceremony, which was closed to the public, also featured performances by the Boston Community Chorus. Broadway star Brian Stokes Mitchell performed Kennedy's favorite song, "The Impossible Dream." As mourners filed into the John F. Kennedy Library and Museum, they were handed a program that featured a quotation from poet William Butler Yeats: "Think where man's glory begins and ends, and say my glory was I had such friends." Earlier, tens of thousands of people stood in long lines for a chance to view the senator's flag-draped casket at the library. Boston Police Capt. Robert Flaherty estimated the turnout at 50,000 over the past two days. 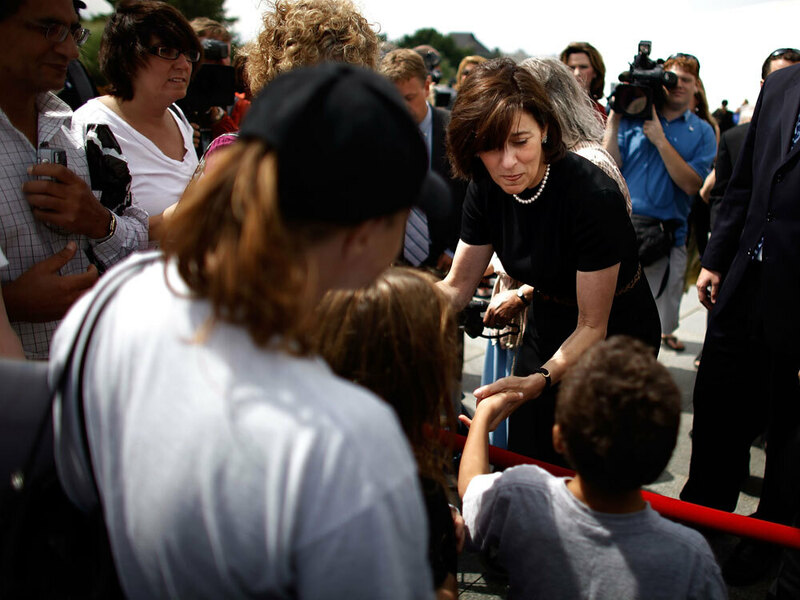 The scene was filled with tears as mourners shared fond memories of the larger-than-life senator. Democratic Rep. John Lewis of Georgia, a longtime civil rights leader, praised Kennedy for his massive contributions to the cause of equal rights. Victoria Kennedy, widow of Sen. Edward Kennedy, greets some of the thousands of people standing in line to see her husband lie in repose. "He's one man that changed America forever," Lewis said. "He made America a better place. ... Sen. Kennedy was our champion. He was our leader. He was our shepherd. Without him, we must regroup." Visitors came from all over the country and the world, from as far away as Nigeria and Portugal. But many recalled how they had been helped personally by Kennedy during his 47 years in the Senate. Ellen Freed of Brookline, Mass., who has epilepsy, credits Kennedy for her federally assisted housing. "I live in a HUD building, and if it wasn't for Ted Kennedy, I would be homeless," she said before filing in to view his casket. 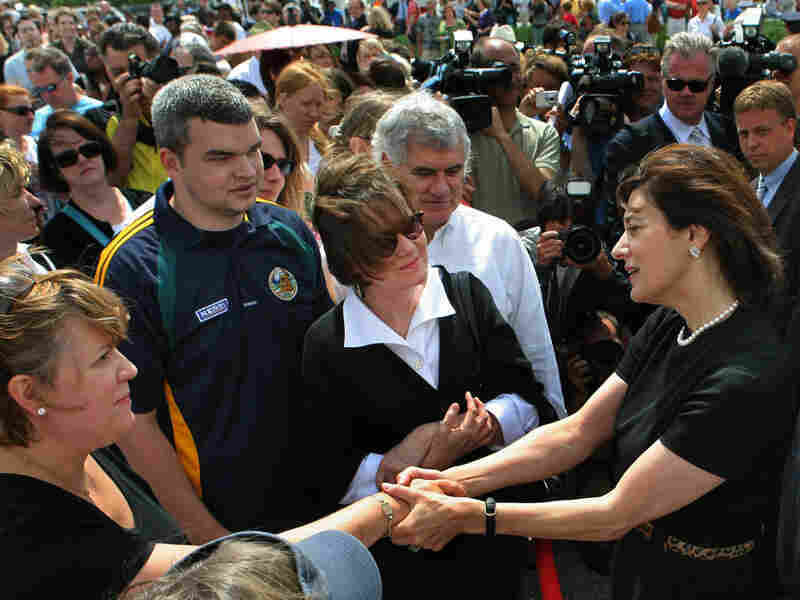 Members of the Kennedy clan, including his daughter Kara Kennedy Allen and 81-year-old Jean Kennedy Smith, the senator's sister and the last surviving Kennedy sibling, greeted many of the visitors. "This is a hard time for me," Smith said, choking back years. "It's a wonderful tribute to Teddy and the lives that he touched." The family has been preparing for this moment ever since Kennedy was diagnosed with brain cancer more than a year ago. "The last year of his life was almost a gift, because he knew that he didn't have much time, but he was able to kind of take a victory lap," said Robert F. Kennedy Jr. "He was able to accept a lot of the tributes that were offered to him in the last year, and that was really touching to him." A five-person military honor guard stood at attention around the casket in a high-ceilinged room overlooking Boston Harbor. The crowds were so large that viewing hours were extended on both Thursday and Friday. The library remained open until 2 a.m. Friday morning, before reopening at 8 a.m. The doors were closed shortly before 3 p.m. to allow preparations to begin for the memorial service. President Obama is scheduled to deliver a eulogy during a funeral Mass on Saturday morning at a Roman Catholic basilica in Boston. After the funeral, Kennedy's body will be flown to Washington for burial at Arlington National Cemetery in northern Virginia, where he will be interred Saturday evening near the grave sites of his brothers John and Robert.